Naksh, Kirti wedding Will Kirti discover Naksh’s secret? What will Naira do to mend the situation?on Not Without My Family May Teasers Star Life -2019. Despite Akhilesh and Surekha’s refusal, Dadi insists them to do Kirti’s kanyadaan. How will Manish and Swarna feel about it? Manish and Swarna do Kirti’s kanyadaan. Later, Kartik watches Yash and Naksh’s video clip! Kartik fails to stop the wedding, while Naksh and Kirti’s marriage is solemnised and they seek the blessings of the family. Kartik confronts Naira for hiding the truth and accuses her of deceiving him. The Goenkas get emotional during Kirti’s bidaai. The Singhanias carry out Naksh and Kirti’s post-wedding rituals. Naira tries to pacify Kartik who is upset with her. Naira is worried on seeing Kartik’s message asking Naksh to reveal the truth to Kirti. She reveals the truth to Rajshri and shares her miseries. Naksh and Kirti prepare for the wedding night. The Singhanias and the Goenkas celebrate the post-wedding reception. Will Kartik attend the it? Kartik confronts Naksh for deceiving Kirti and vents out his anger on Naira. Will Kirti discover Naksh’s secret? Naksh promises to take care of Kirti forever. On the other hand, Kartik is still upset about their marriage and lashes out at Naira. Kartik finds Aryan’s photo in his office. Meanwhile, Naira decides to tell the truth to Kirti. 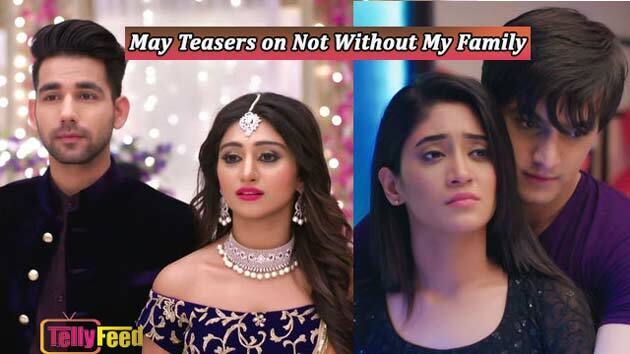 Naira makes Kartik realise about Naksh’s concern for Kirti, while Aryan becomes suspicious seeing his father’s interaction with Swarna. Naira rejoices when she meets Kartik. The Goenkas give Kartik and Naira a grand welcome. But, is everything alright between them? Dadi tells the truth to Kartik and requests him not to misunderstand Naira. Will things become better between the two? Naksh and Kirti visit the Goenkas to celebrate Bhai Dooj. Kirti breaks down on learning that Naksh didn’t want to marry her for love. How will the Goenkas react? Manish blames Naksh for ruining Kirti’s life. Later, Naksh shares his feelings for Kirti with Naira. What will Naira do to mend the situation? Naira, Kartik leave the decision to Kirti whether she wants to go to US or give Naksh a second chance. What will Kirti decide? The Goenkas are happy as Kirti and Naksh clear their misunderstanding. Kartik also plans a surprise for Naira. Will Naira and Kartik also come close? Rajshri and the Singhanias are delighted when Naksh returns home with Kirti. Kartik apologises to Naira for ruining their relationship. Will Naira forgive him? Kartik meets Naira and clears the misunderstandings between them. Naira is very excited about her birthday but what’s on Kartik’s mind? While Dadi doesn’t wish to celebrate Naira’s birthday, Kartik is busy planning a surprise for her. Is it enough to impress Naira? Dadi makes arrangements for a puja on Naira’s birthday and asks her to keep the ashram kids away. But what happens when the puja gets foiled? Kartik has acute body pain as he prepares for Naira’s birthday party. Meanwhile, Manish and Dadi are not happy with Kartik’s idea of organising the party at Singhania Sadan. Naira gets emotional seeing Kartik’s surprise for her. Meanwhile, Aryan stumbles on a shocking truth! Kartik and the family members surprise Naira with many gifts. However, Aryan spoils the birthday cake by mistake. How will Manish react? Swarna’s decision to not accept Aryan as her son leaves him vulnerable. He holds Kartik responsible for his ill fate. Heartbroken, will he take any drastic step? On learning about Naira-Kartik’s plan for a trip to Greece, Dadi decides to send Naksh and Kirti too with them. But Naksh has other plans! While Kartik-Naira and Kirti-Naksh are all set for their trip to Greece, Aryan bribes the officer to get the tender for the Goenkas! While Aryan plans to trap Kartik, Kartik decides to cancel his honeymoon trip. How will Naira react to this? Kartik manages to cancel his business trip. He and Naira leave for Greece to enjoy their honeymoon. However, why are the police searching for Kartik? Kartik and Naira’s honeymoon takes a wrong turn when Kartik gets abducted by a few goons. What will Naira do now? Naira rescues Kartik and then they go dancing at an Indian club. Later, Kirti and Naksh also reach Greece. Kartik and Naira get surprised to see Kirti and Naksh in Greece, while Aryan eagerly waits for Kartik’s arrest. Later, Kartik and Naira get an invitation to attend a Greek wedding!